Many individuals still suffer from dental anxiety or phobia, making them unable to get the dental care they desperately need. Dental phobia can significantly affect your oral health because you are avoiding the treatment instead of doing something about your teeth problems. At Cardiff Dental, we aim to provide patients of all ages with a pain-free, comfortable and pleasant dental experience. That’s why we have developed unique services to make sure that you leave with a good, positive feeling after your visit with us. Oral sedation is one of the most popular methods of sedation dentistry to ease dental fear among patients who are extremely uncomfortable about dental visits, drills, and needles. This type of sedation involves taking medication to relieve dental fear and anxiety. The treatment is also called sleep dentistry, but the patient remains conscious and capable of responding to the dentist’s requests during the procedure. Happy gas is also referred to as “laughing gas” and is a mixture of nitrogen and oxygen. The gas is odourless and colourless and its correct term is nitrous oxide (N20). 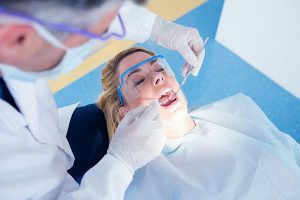 For patients who have an innate fear of dentists, this type of conscious sedation is often used to promote a sense of relaxation, calm and overall well-being. Laughing gas has very minimal side effects and is therefore considered safe to use on patients of all ages. Don’t put off your dental care because of fear and anxiety. If you are not comfortable with dental appointments and treatments, you can chat with your dentists at Cardiff Dental and we will be more than happy to make your dental experience as relaxing and stress-free as possible. For more information about our conscious sedation options, contact us on (02) 4954 6888 today!